This simple cake recipe is very easy to follow, and by applying easy variations to the one basic recipe, you can make up to one dozen (12) different dessert cakes. It's so versatile! 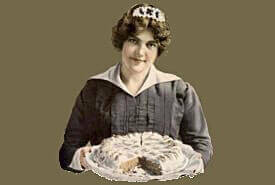 You'll be proud to serve these delicious old fashioned cakes to your family and guests. Note: All measurements are level. First: Beat or work the butter with a slotted wooden spoon until it has a whitish appearance around the edges. Gradually add the sugar to the butter, beating the mixture, meanwhile. Second: Sift the flour, measure, add baking powder and sift three times. Third: Separate eggs. Beat yolks until light. Fourth: Beat egg whites until very light and fluffy. To the creamed butter and sugar add eggs yolks, then alternately the 2/3 cupful of milk and the flour with the baking powder. Beat thoroughly until smooth. Add flavoring. Then carefully fold in the egg whites. Bake in 2 round layer greased pans (8 x 1-1/4 inches) or in a loaf pan (7 x 7 x 2 inches) in moderate oven (350°F to 375°F). Spread Mocha Frosting (see below) between layers and top and sides of cake. Decorate with walnut meats. Use simple cake recipe. Bake in 2 layers or double the recipe and make 3 large layers and add the orange filling. Mix in order given. Cook in double-boiler until thick enough to spread. Spread filling between layers. 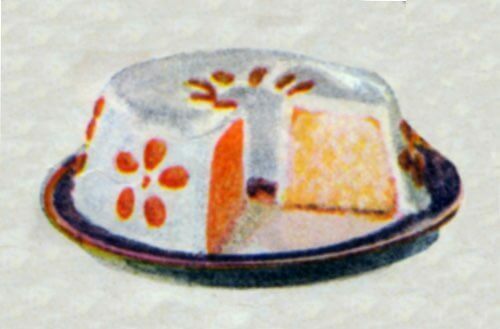 Cover top of cake with White Mountain Cream Frosting (see below) with orange flavoring added, and 1/4 teaspoonful salt. 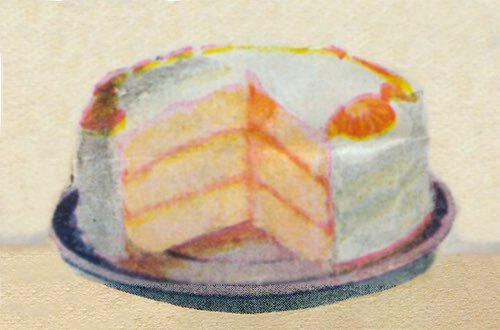 Spread on top of cake and decorate with thin half slices of orange. Use the basic, simple cake recipe. Fold in stiffly beaten whites of 3 eggs instead of 2 whole eggs. Bake in small loaf pan. 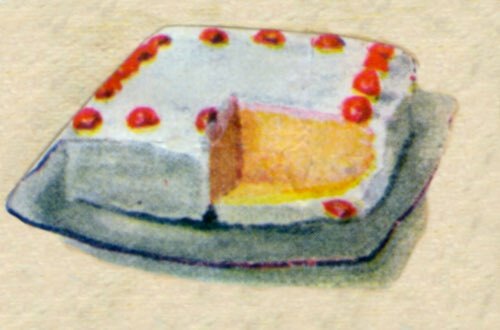 Cover with Butter Cream Frosting (see below) and decorate with candied cherries cut in halves. Bake simple cake recipe in 2 layers. 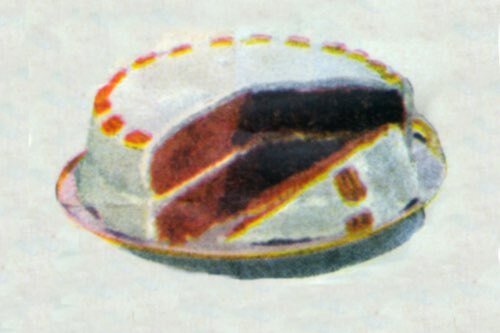 Spread jelly, White Mountain Cream Frosting (see below) or custard filling between layers. Cover with sweetened whipped cream. Bake simple cake recipe in 2 layers. Use 1/2 cupful nuts, 1/2 cupful raisins or dates, and 1/2 cupful figs, all put through a food chopper and mixed with boiled icing as filling. 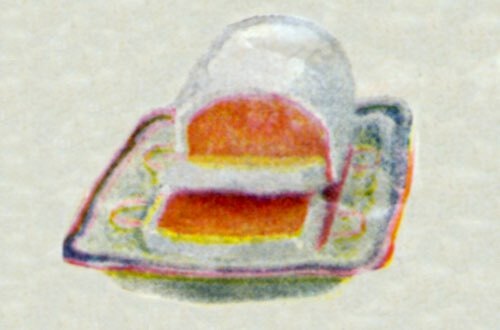 Ice with plain icing. Divide basic cake mixture into 2 parts. Add 4 tablespoonfuls cocoa powder to one part. Drop by spoonfuls into pan — alternating light and dark. Basic simple cake recipe. Take out 4 tablespoonfuls flour and add 6 tablespoonfuls cocoa. Bake in 2 layers or loaf. Cover with Butter Cream Frosting (see below). Decorate with halves of pecan meats. 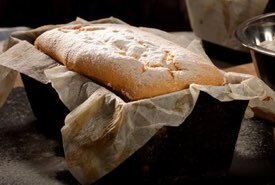 Bake in long loaf and cover with Sea Foam Icing (see below). Bake Silver Cake (recipe above) in layers. Make a boiled icing. Mix 2/3 cupful of coconut with 1/3 cupful frosting. Put between layers. Cover cake with white icing of choice. Sprinkle generously with coconut. Bake in loaf — slow oven (325°F). Make Silver Cake (recipe above), adding 3 tablespoonfuls coconut, 1/3 cupful chopped nuts, and 1/3 cupful chopped citron. Bake in stem tin. 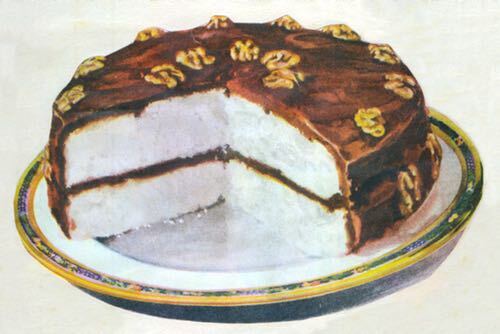 Cover with White Mountain Cream Frosting (see below) flavored with almond or vanilla. Decorate with almond flowers. Basic simple cake recipe — using 3 egg yolks instead of 2 whole eggs. Bake in stem pan. Cover with White Mountain Cream Frosting (see below) flavored with almond or vanilla. Decorate with candied fruits or nuts. Boil until it spins a thread. Pour hot syrup on a stiffly beaten egg white. Beat until of spreading consistency. Powdered sugar enough to make a frosting that will spread evenly. Cook until it spins a thread. Pour hot syrup on a stiffly beaten egg white. Add 1/2 teaspoonful cinnamon. Beat until cool and creamy to spread. Confectioners' sugar enough to stiffen to easy spreading consistency. Spread frosting between layers and top and sides of cake. Decorate with walnut meats.